Spending time in Cambria will open your senses and let that creativity flow. Artists of all disciplines will find the peaceful beauty and spiritual inspiration that nature brings. The best way to discover it is to park and walk around, seeing the variety in person is the only way to go! You need look no further than the village artisans who have taken up shop to share their art with the world. There aren't any chain stores so the original arts and crafts you will find here are sure to spark some ideas. From fine art to outsider crafts, there is something for every creative type and so many special gifts to choose from in the artists colony of Cambria. 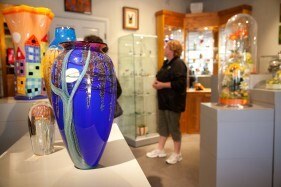 In addition to the many shops in Cambria, there are several artists who have their private galleries here. Local legend Art Van Rhyn has his studio right down the street, and artist Artist Riccardo Gallery brings an international flair to our seaside town. There are artist and potters all along Main Street as well as fine jewelers and glass artisans. Many times you can view demonstrations of the techniques used and talk directly to the artist about their work. Fun spots to dine include The Cafe on Bridge Street which has a wonderful back patio with all kinds of creative touches...and the food is awesome, closes at 4pm, lunch only. Robins patio tables are a mosaic delight and make outdoor dining more fun. If you prefer to create your own, Soto's True Earth Market offers a wide variety of organic items and deli for that custom picnic experience. Cambria can be a quiet town at night, but on the first Saturday of each month there is an evening Art Stroll that features an open house atmosphere and the shops stay open late. It is also fun to walk around after the shops close and window shop. And of course, there is nightly music at the Cambria Pines Lodge and often the Cambria Pub & Steakhouse. *72 hour notice required for food items. Tax is included. Box of Assorted Chocolates $28 The sweet taste of local confectionery Sweet Offerings. We will place one pound of select David Bradley Premium dark and milk mixed chocolates in your room prior to arrival. We will have four large chocolate covered strawberries in your room upon arrival. A decedent display of delicious tasting strawberries is a perfect way to treat yourself the moment you enter your room. Arrive to a wonderful selection of seasonal fruit and decadent cheeses. Pair with a bottle of local Central Coast wine from one of our renowned wineries and start enjoying your stay as soon as you enter your room. Fruit, Cheese, and Crackers. We are located adjacent to the best wineries California has to offer. Let us place a bottle of featured local red wine in your room prior to your arrival. We promise you won't be disappointed in what we have to offer. Featured wines vary at time of arrival. Great when paired with our fruit and cheese platter, enjoy a delightful bottle of local white wine. We will place a bottle of local white wine in your in room's refrigerator for your arrival. Featured wines vary at time of arrival. These options will be available for purchase when you book your stay.